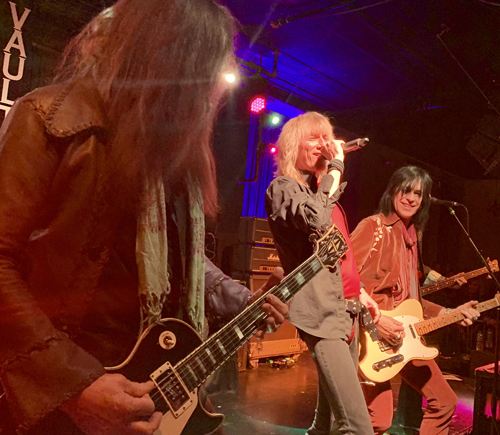 KNAC.COM - Reviews - KIX In New Bedford, MA With Photos! 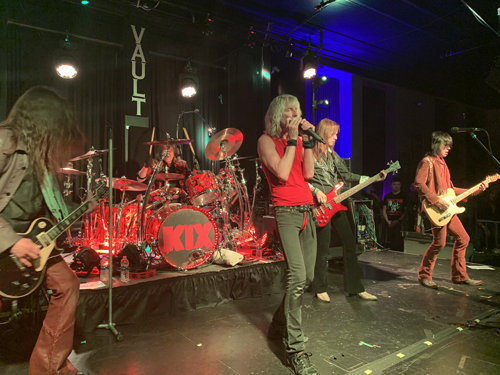 It was an unseasonably warm evening when Maryland-based rockers KIX hit the stage at The Vault Music Hall & Pub. However, the temperature outside paled in comparison to the blazingly hot performance the band put forth to an incredibly enthusiastic crowd on this night. The night kicked off with local cover band SAN DIMAS. I'm friends with the band's drummer Roger Chouinard so I'm always a bit worried when I see them performing a show that I'm covering. But they were a great way to get the crowd warmed up with their eight song set of the best of the 80's metal scene. They opened up with two strikingly good songs in WARRANT's "Down Boys" and WHITESNAKE's "Slide It In". Guitarist Roy Maher was on fire throughout the set as the band rocketed through "Shot In The Dark" from OZZY OSBOURNE and a surprisingly fun rendition of RATT's "Back For More" which is a song that I haven't listened to in quite a while. I found it a nice treat to get reacquainted with the song. The crowd seemed to be really into this particular song as they were at the most interactive when they were asked to sing along to the chorus. Despite not being a huge fan of the band FIREHOUSE, I loved hearing "All She Wrote". I thought singer Mike Golarz was particularly good on this one and on the band's cover of SKID ROW's "18 And Life". If the goal of opening a show is to prime the audience for the rest of the night's performances, SAN DIMAS did a remarkable job of getting the night off to a rollicking good start. If being friends with someone in a band I'm reviewing gives me a sense of trepidation, you can imagine how paranoid I must be when I'm seeing a band that I've not only never seen live before, but I've never even heard of before. Such was the case with the New York-based rockers STATION. I had zero familiarity with them and as such, I was definitely worried that it would affect my potential enjoyment of their music. But in wonderful turn of events, this rocking quartet blew me away with their highly melodic yet hard driving rhythmic rock and roll. Though there was a bit of a problem at the start with the microphone for singer Patrick Kearney, the band rocketed from one song to the next and I couldn't help be a bit mesmerized by the performance. That lack of familiarity with the material didn't hamper my enjoyment of the set (except perhaps as I tried to construct the set list for my notes). Opening with "All You Need Is A Heartbeat" and pumping lifeblood to prove that rock and roll is far from dead, you could see how tight the band was musically. While the set was all originals, STATION did throw in a small sample of BLACK SABBATH's "Heaven and Hell" during the performance of their song "Cost of the Sand" which was a instantly intriguing song for me. 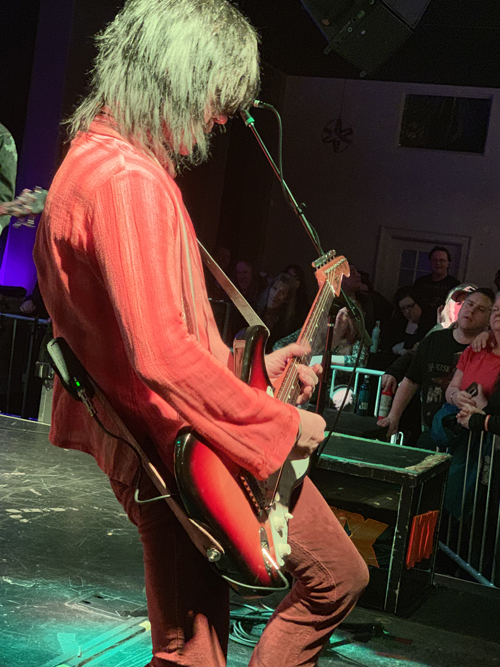 By nature of the performance, Kearney was spotlighted throughout the set, but when the spotlight turned to his bandmates, they didn't shrink from its glare. Co-founding guitarist <>Chris Lane (tagged with the nickname Danger throughout the set) had a striking solo during "One And Only" and if you want to get acquainted with a powerhouse drummer, you should've seen the solo that drummer Tony Baptist laid down at the end of "Never Enough". I'm not usually enthused about drum solos, but this guy really threw down one foundational rhythmic beat during his solo and I honestly would've loved to see him go on longer because it was so good. Bassist Emi Asta was directly in front of where I was positioned at the stage front and you could feel the energy dripping from every note he played as well. Between the more potent rockers like "More Than Enough" and "Still The One" and slightly more restrained songs like "I Won't Break Your Heart" and "Are You Sleeping Alone", STATION has a wide range of material that any rock and roll fan can attach themselves too. I was at the show with my friend George and his comment to me was that he'd love to see more melodic rock bands like STATION touring the area, but they just don't play here. I had to agree with him because I have to admit to being a bit stunned how good this band is and how much I was in tune with their music. These guys are the real deal rock and roll you've been looking for! CONCERT FUN FACT: After the band's set, I ended up going out to the merchandise table and talked briefly with singer Patrick Kearney to say how much I enjoyed their show. I also put my money where my mouth is and picked up their two albums, Station and More Than The Moon. "All You Need Is A Heartbeat"
"I Won't Break Your Heart"
I guess that you could say that given how I was buzzing from my introduction to the music of STATION, there was a chance, no matter how small or ridiculous sounding, that I might be in for a bit of a letdown if KIX hit the stage and were anything less than what I was hoping for. 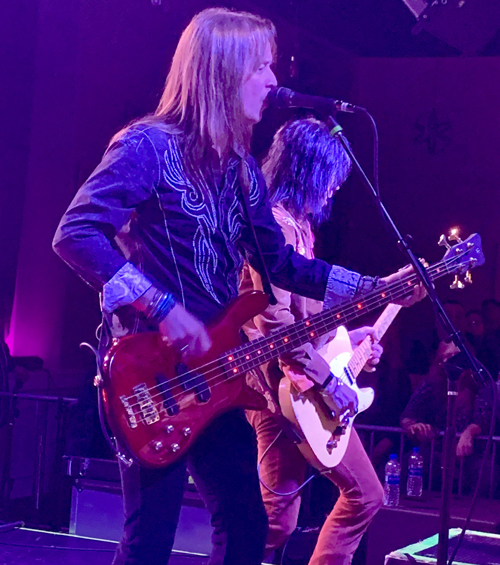 I have to confess that I've only seen KIX live one other time and that was nearly 30 years ago. And despite the band's long held reputation as a great live act, I wasn't all that taken with their performance on that night. So the question raised by that was did they have an off night when I first saw them? Or was I stupid by not being taken in by their performance? Sadly, I think the jury came back with the "He's stupid" verdict because from the moment KIX hit the stage at The Vault with a dynamically explosive show, I was kicking myself for my previous doubts over their live reputation. 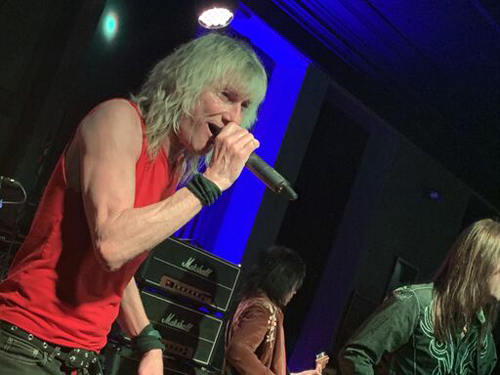 Fueled by the manic and kinetic ball of energy that is frontman Steve Whiteman, from the first notes of "Wheels In Motion" to the final strains of "Yeah Yeah Yeah", KIX held the audience in their grasp. 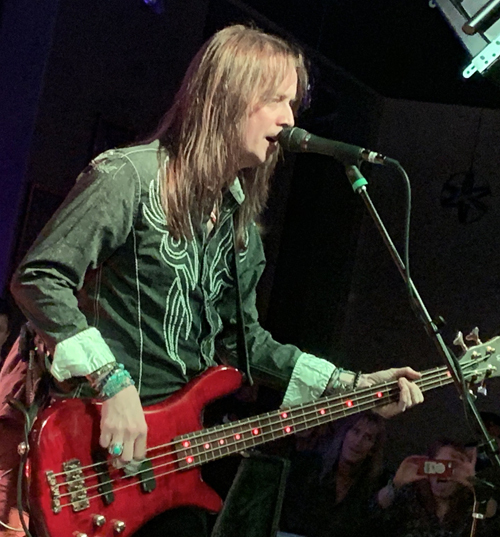 Given that I was so close to the stage, both Whiteman and guitarist Ronnie "10/10" Younkins, were at times less than two feet in front of me as the band rocketed through a set list that touched upon as much of the band's catalog of material as possible. 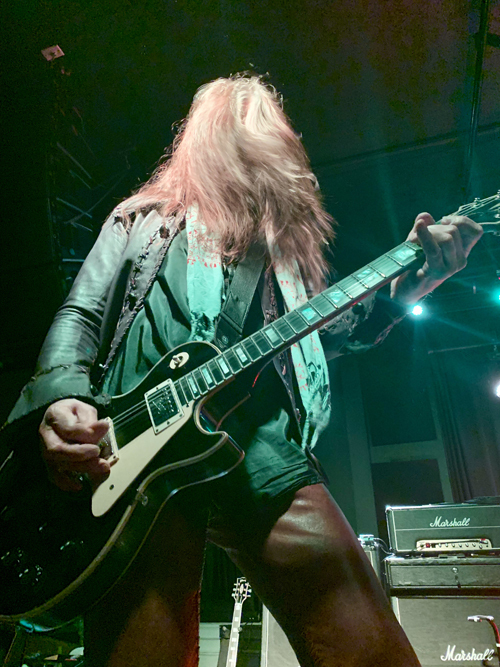 With Younkins, guitarist Brian "Damage" Forsythe and drummer Jimmy Chalfant each getting some time for solos and Whiteman continually amping up the crowd, there was barely time to catch your breath before they set off their next song. I was pretty surprised to see bassist Mark Schenker having such a relatively understated stage presence, especially given how much of the material he created for the Rock Your Face Off album. 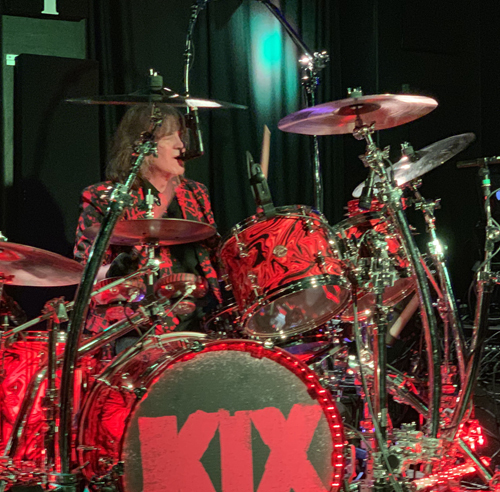 Still, between his playing and backing vocals, he's certainly cemented his place with KIX. Steve Whiteman worked the crowd with the adept touch of a master. I was amazed by the energy he put forth, which never seemed to flag. Whether telling a story to introduce a song (I don't think I'm likely ever to forget the peanut butter story leading into "Cold Shower" or the notion of Whiteman opening an umbrella inside during the performance of that song. My superstitious side freaked a little on that note) or playfully giving some crap to the audience as a whole or certain individual people, the crowd was whipped into a frenzy throughout the set. It was a blast hearing the band rocket through songs like "No Ring Around Rosie" and "Get It While It's Hot" and "Midnight Dynamite" to be sure. And when they played songs that I was admittedly less familiar with like "Mighty Mouth" or "The Itch", I was taking note at how much I was grooving to the tracks. Like the rest of the crowd, I was cheering along and raising the fists and calling out my enjoyment. Normally, I watch a show I'm reviewing in a much more analytical way but the band's enthusiasm carried over to me. I gained a new appreciation for the song "Girl Money" on this night. With Whiteman right up in front of me during the song, there was a greater sense of immediacy to the song. 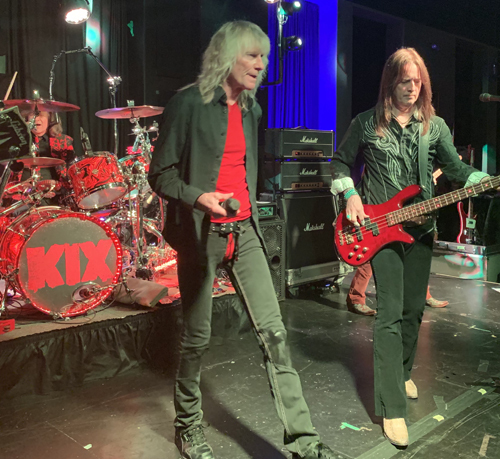 Of course, as the show wound towards its conclusion, KIX broke out "Don't Close Your Eyes", their ballad and likely best known song. As you might expect, this brought about one of the biggest crowd reactions. Don't get me wrong, I like that song but for me the capper of the evening was the back to back performances of "Cold Blood" and "Blow My Fuse". In "Cold Blood", you have my favorite KIX song. Between the song itself and the memories of their positively electric video for it from back in the day, I've been a huge fan of the song from the first time I heard it. So getting to see it live and right up close was a great moment. And as for "Blow My Fuse", the tongue in cheek nature of the lyrics and the absolute grinning performance from the band makes it a winning rocker. As I said, I'm stupid and have no reasonable explanation for why I wasn't taken with the band's live show when I saw them in 1990. But now, the whirling dervish performance from singer Steve Whiteman and from the band as a whole certainly proved that the reputation KIX has as a sterling live act is well earned. I was already a fan but this was something else. 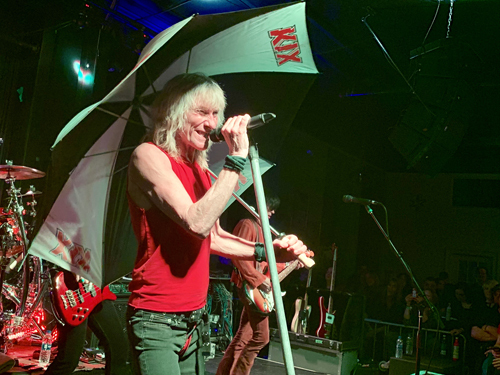 Simply put, the KIX show at The Vault Music Hall & Pub was one of the best live sets I've seen in 30 plus years of attending concerts! "Get It While It's Hot"
"Love Me With Your Top Down"
CONCERT FUN FACTS: Oddly enough, assuming I didn't somehow miss it, there didn't seem to be a merchandise table for KIX. This was somewhat disappointing as I would've loved to pick up a T-shirt. During the intro to "Don't Close Your Eyes", I was one of the recipients of a fist bump from singer Steve Whiteman.